Heritage haunts: I visit the colonial style Raffles Hotel to experience a walk through its historic areas. The Writer’s Bar and mention of the fact that Somerset Maugham was an honoured guest here has me engaged. Later, ensconced at yet another heritage luxury boutique property, Hotel Fort Canning, it is a pleasure to enjoy a high-tea with tarts and, of course, tea, turn in for the night and explore its old-world charm in the morning. I savour Singapore’s favourites at breakfast in its Glass House Restaurant that is perched amidst a canopy of trees, revelling in the romantic feel that colours the entire property. While I am there, a wedding is in progress and I watch the bride in her elegant white trailing gown walk down the pathway to where her groom awaits. Shopping satiation: Eager to explore as much as I can of Singapore, I put on my walking shoes and fill the hours with delightful experiences. And when the friendly Naseem joins me, we sometimes play truant with the planned schedule as she caters to my customised desires. area and more, I dive in and out of boutiques searching for the perfect bag and clutch, the most scent-sual body mists and, of course, for the young one at home, a prized football jersey! Mission, of course, is accomplished with ease – although for the last item we troop through four sports outlets till we chance upon the precise team and size one. Food fiesta: Suffice to say, the plates in almost every restaurant I eat at please my palate. One of the first drinks that I sip, initially gingerly, is the Singapore Sling, which reportedly was first created at Raffles Hotel. I find it a bit bitter, but the taste grows on me. For one meal, we drive down to The White Rabbit – an exclusive eatery that is located in a beautifully restored chapel. In the Dempsey area, it serves European food and age-old cocktails. The food is classic and simple, but presented with flair. I enjoy the way the fish is deboned right in front of me – a process that takes almost ten minutes – and then served attractively. It takes me just half the time to polish it off. In a contrast of sorts, at least as far as nomenclature is concerned, is The Black Swan – which we venture to one night for dinner. The café and bar in the central business district is in a historic art deco building on Cecil Street. The colour palette of its interiors exudes a luxurious feel. I am glad I save space for the dessert – for its coconut crème caramel that has sprinklings of candied ginger and lemon peel is to die for. A third eatery that also has me turning into Oliver Twist is True Blue, the Peranakan boutique restaurant that offers simple, yet excellent traditional titbits – and, lest I forget, I empty the teapot at the extremely rejuvenating high tea that I relax over at TWG in the Marina Bay shopping area. Beautiful bounty: Singapore has nature at its best with a diverse range of plant life from the world’s four corners. And this is most manifested in its Gardens by the Bay where wonder blooms. 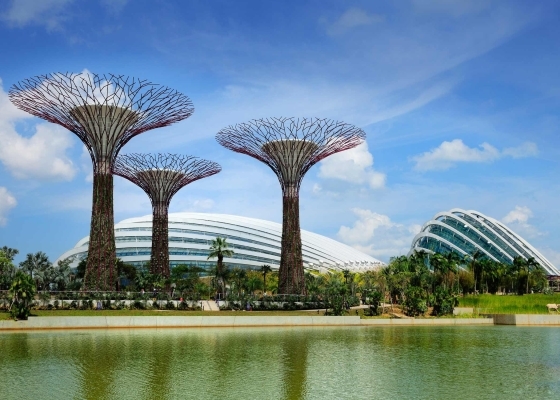 Located just by the Marina Bay Sands, the gardens impress by virtue of the imagination and effort that has gone into creating and planning them. I spend an entire evening walking through the Flower Dome and The Cloud Forest – draping my head with my stole as the temperature dips as I climb higher into the domes. And as I walk through these enormous conservatories, I feel a little like Alice in Wonderland – the trees and plants seem so magnificent and large in their new homes. When the sun sets, it is time for the son et lumiere show that brings the Super Trees to life. The dazzling myriad of light displays burst across the night sky, brilliantly illuminating these huge man-made trees. And then, it is impossible to satisfyingly cover the entire expanse of the gardens – and I leave, promising to return soon. As the car speeds away from the area, Singapore’s skyline – with the Marina Bay Sands Hotel looming large over it – shines brightly under the starlit sky. Read more about Singapore’s Changi airport here.